After this nice trip in the lovely region we have to move somewhere else. Then, were can you see this house? Nobody even venture a guess in a week or more? OK I'll start the process. I guess this is what may be called Boutique Hotel and that we are somewhere in North West France? No it's not an hotel. France is not correct even though there is link. Anyway when you say "N-W France" you are not far the solution. Knowing your taste I guess one of the small and obscure ones. My guess is Jethou or Herm, although I haven't found this Villa. That time,"small and obscure" wasn't my choice. About the villa, don't forget that I told you it is linked with France (or a French place). Then it may be Sark? No not Sark.But you are very close. As its house in Place des Vosges in Paris, Hugo's Hauteville is obviously a place to visit.A bit extravagant as Hugo was himself. No I have NOT forgotten my duty, it only took a while to find a suitable puzzle. Last edited by ombugge; December 5th, 2015, 03:32. Anything to do with Kwai river? You are fast. Yes it has got something to do with Kwai River. 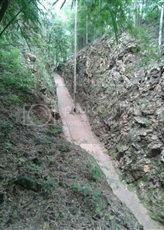 Is it the cutting at Hellfire Pass,a former section of the railway,now used as a walking trail? All times are GMT+1. This page was generated at 17:46.